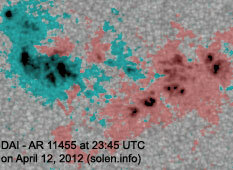 Last major update issued on April 14, 2012 at 06:05 UTC. 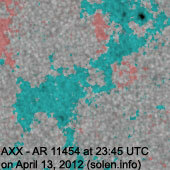 The geomagnetic field was quiet to minor storm on April 13. 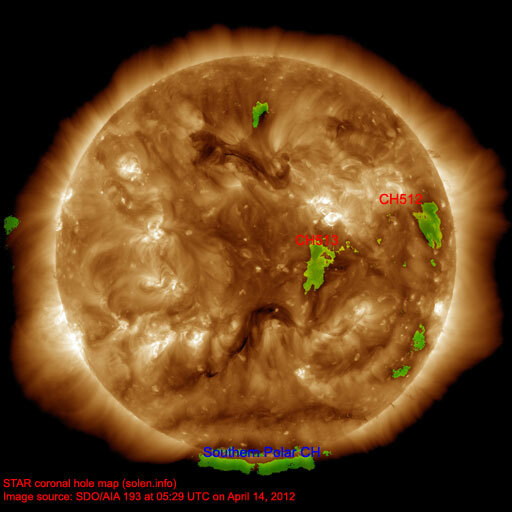 Solar wind speed at SOHO ranged between 530 and 687 km/s under the influence of a high speed stream associated with CH512. 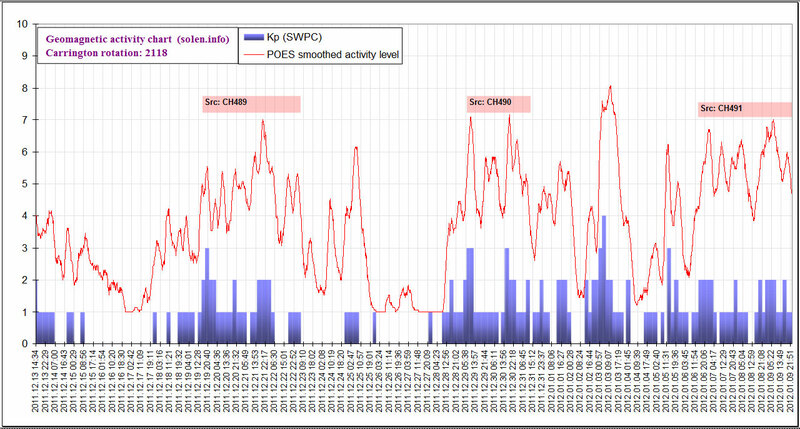 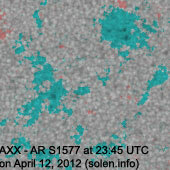 Solar flux measured at 20h UTC on 2.8 GHz was 97.7 (decreasing 4.7 over the last solar rotation). 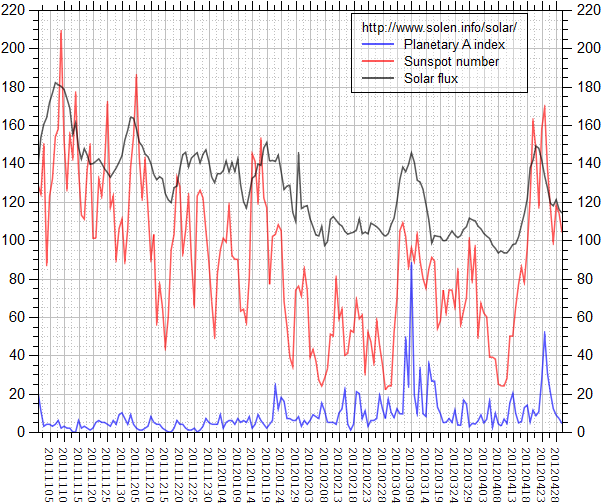 The Potsdam WDC planetary A index was 26 (STAR Ap - based on the mean of three hour interval ap indices: 26.0). 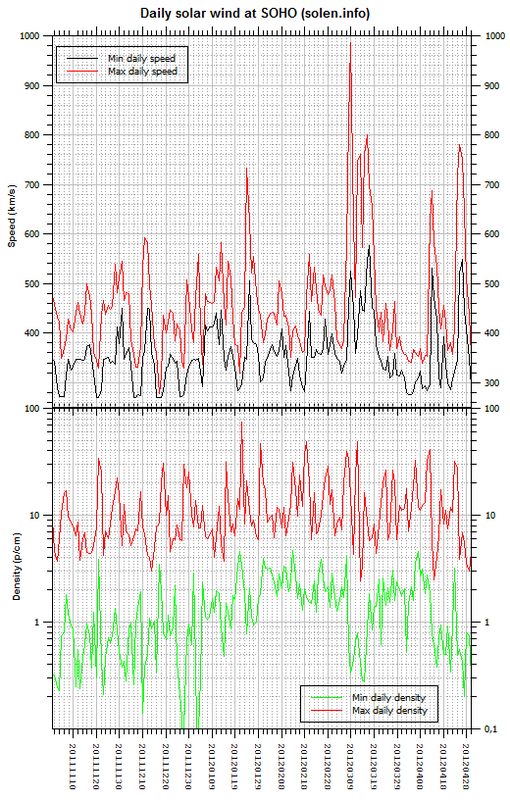 Three hour interval K indices: 55442333 (planetary), 45442222 (Boulder). 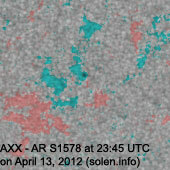 Region 11454 [S13E27] decayed slowly and quietly. 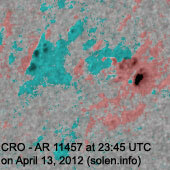 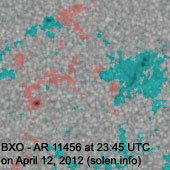 Region 11455 [N07W19] added a few spots and could produce C flares. 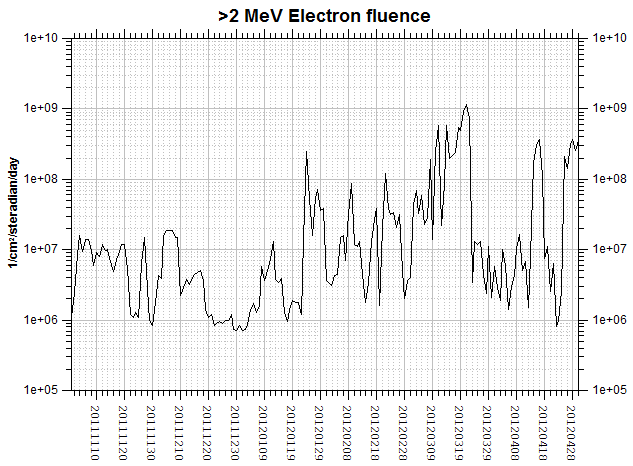 There's still minor polarity intermixing. 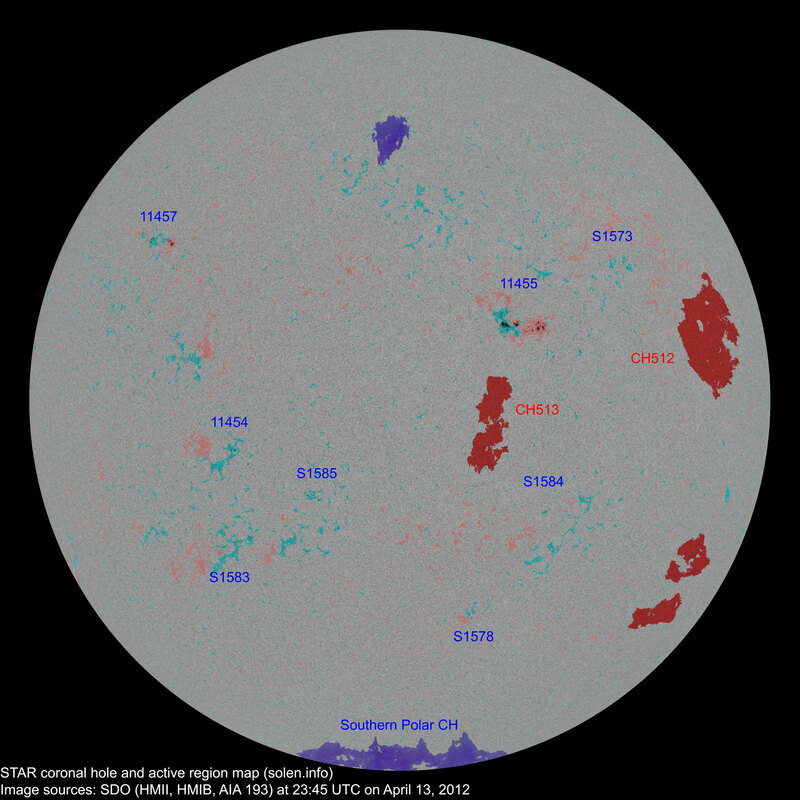 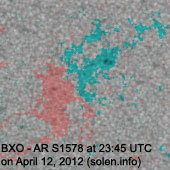 New region 11457 [N22E44] emerged in the northeast quadrant on April 12 and got an SWPC number the next day. 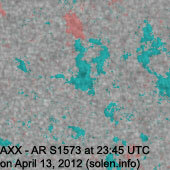 S1573 [N27W37] reemerged with a single tiny spot. 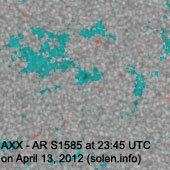 S1578 [S40W15] was quiet and stable. 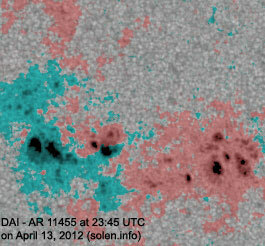 New region S1583 [S27E30] emerged in the southeast quadrant. 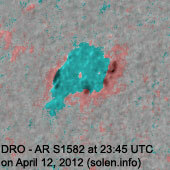 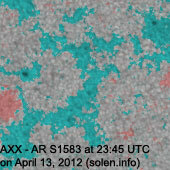 New region S1584 [S23W25] emerged in the southwest quadrant with a tiny spot. 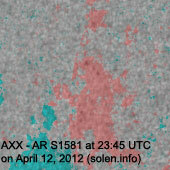 New region S1585 [S21E13] emerged in the southeast quadrant. 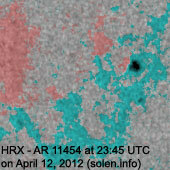 The geomagnetic field is expected to be quiet to active on April 14 due to effects from CH512. 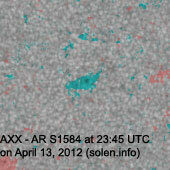 Quiet to unsettled is possible on April 15-16 due to weak effects from CH513.